Visit Silva's to see our collection of fine art such as the bronze sculpture shown below. We have more bronze sculptures, carvings, paintings, and wearable art too! 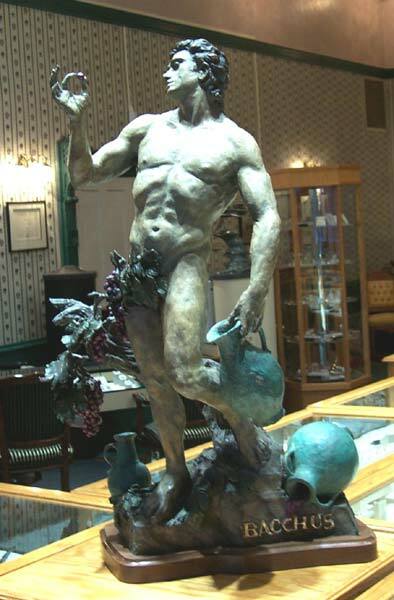 Bacchus, the god of wine and conviviality, was angry because of some slight against him and swore revenge. He announced that the first mortal to come across his path would be eaten by tigers. Just at that moment along came the lovely unsuspecting maiden Amethyst, on her way to worship at the shrine of the goddess Diana. Diana turned Amethyst into a statue of pure crystalline quartz to protect her from the brutal claws. Bacchus wept tears of wine in remorse for his action at the sight of the beautiful statue. The god's tears stained the quartz purple, creating the gem we know today.